Trailhead: Waterville Valley Ski Area Parking Lot #1. From I-93, take exit 28 for Route 49. At the bottom of the exit ramp, head East on Route 49. After 10.4 miles, turn left onto Tripoli Road. Follow Tripoli Road for 1.2 miles, then turn left onto the Waterville Valley Ski Area. The trail starts right across from Lot #1. Mt. Tecumseh is the lowest of the NH 4000 footers. It's only 5 miles which makes it a good hike for intermediate level hikers and athletes. There are some long, steady, and fairly steep sections but overall the mountain is a good opportunity to test out new equipment and your capabilities. Starting across the parking lot, head on the Mount Tecumseh T. After 1.2 miles, you will reach a view point area that offers sweeping views of the ski area slopes. 1 mile later at the junction with Sosman Trail, continue right. This ~0.6 mile mini loop takes you around the summit of Mount Tecumseh. At the summit, there is a large rock with a semi-wooden summit view. This is a good opportunity to stop for lunch and relax. 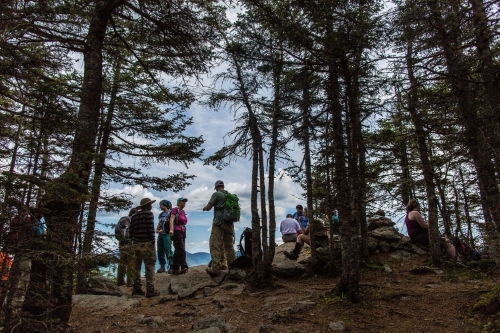 The summit area is small so it may get crowded fairly quickly in the summer. After you summit, trail loops around and takes you back to the Mount Tecumseh Trail. Another option is taking the Sosman Trail for 0.6 miles and then walking down the ski slopes instead. I tested out my new hiking boots on this trip - and realized quickly that they weren't even close to being worn in. If you're wearing in your boots, I would recommend buying athlete's tape (here) and moleskin (here) to protect your heels and sore spots.